Touted as a wonder crop, hemp has largely been absent from U.S. farmlands since the 1930s despite its wide range of practical applications from paper to medicine, food and cosmetics. Consequently, consumer demand for these products was met strictly by imports, leaving farming, processing and manufacturing jobs associated with hemp abroad, too. Now hemp is back, and in 2017, Montana farmers legally planted the first crop of industrial hemp in 80 years as part of the Montana Department of Agriculture (MDA) Industrial Hemp Pilot Program. A total of 14 growers were selected to participate in the groundbreaking pilot program. Participants planted 16,250 pounds of hemp seed, which was imported from Canada – all of which is now in full compliance with federal law. “Our growers can use banks and face no risk of prosecution by the federal or state authorities,” confirms Cort Jensen, MDA chief attorney, whose tireless advocacy efforts were behind the launching of Montana’s new program. Under the guidance of the department, local farmers are finally able to benefit from growing industrial hemp, both economically and environmentally. “Hemp has the potential to increase farm income at a time of lower commodity prices,” explains Ian Foley, MDA hemp program manager, and hemp can be cultivated under several different sets of farming practices, including USDA certified organic. In the coming years, Montana pulse farmers can opt to grow hemp as a rotation crop since the plant’s natural resiliency to pests and diseases, as well as its lower water requirements, make it an attractive choice. However, both Jensen and Foley caution that at the federal level there are still several pieces of legislation that could impact future hemp production. As such, it remains vital that the agricultural community stays abreast of these efforts, specifically the Industrial Hemp Farming Act of 2017 (introduced July 28, 2017), Industrial Hemp Water Rights Act (introduced July 18, 2017) and Marijuana Justice Act of 2017 (introduced Aug. 1, 2017). Six years ago, Andrew Long and Bob Quinn started The Oil Barn, a farmer-owned oilseed-processing operation located near Big Sandy. Since then, they’ve established a successful business model, meeting demands for high-quality, locally produced oil for the food and cosmetics industries. “Over the years, as I traveled around visiting food shows, I noticed that food companies were using hemp ingredients more and more,” Long says. “I thought it would be great for our business if we could grow and process hemp in Montana.” Unfortunately, there remained numerous regulations on hemp and the idea remained untapped. That is until earlier this year, when to Long’s pleasant surprise, a notice arrived in the mail announcing the Montana Industrial Hemp Pilot Program. “This first year, growing hemp was experimental for us,” Long says. “There were three varieties available and we decided to compare them all side by side to see if there would be any significant differences between them. For the second year, I’ve heard there will be even more varieties available,” he says, and is already looking forward to them. 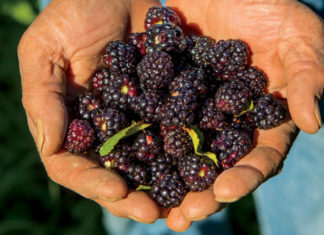 For other Montana farmers interested in pursuing this new specialty crop, Long recommends following the seeding, harvesting and post-harvesting suggestions very closely, as some aspects are very different from other crops grown in Montana. As the success of Montana’s hemp program grows, so too will the need for more processing and manufacturing facilities, creating even more economic growth for years to come. Does the MT. Dept Ag. foresee new grants coming available for first time hemp farmers under the imminent new farm bill? Who is the best to contact in regards to finding and new programs?